Imagine yourself on a stage in front of 3,000 people. Everyone is staring at you with anticipation. The room is eerily silent. The eager listeners in the audience came to see you. The topic doesn’t matter, only the fact that you are the center of attention. Does this thought inspire your supreme confidence and unabashed enthusiasm, or does it conjure up some of your worst fears? According to a Gallop Poll, 40% of us are afraid of public speaking. So afraid that we’re more scared of speaking than death or snakes. I’ve been there myself. When I was an intern in college, I called in sick on my last day of work just so I didn’t have to give a short presentation to a small group of engineers (who I had worked with). Why is speaking in front of others so terrible for most of us? It turns out that the millions of people petrified of public speaking share the same three universal fears. Fortunately, all of these fears can be conquered if you just know what they are and specific strategies for dealing with them. Let’s look at these three most common public speaking fears and how to eliminate them starting today. The first is a fear of saying the wrong thing, or in the wrong way. You’re trying to express yourself, but you’re afraid you’ll forget what you wanted to say, you’ll “blank out,” you’ll mispronounce words, you won’t speak loudly enough, or you will fail to articulate what you meant. Your goal is to share content with your audience, and yet you fear stumbling over the content itself (or completely forgetting it). Do you usually memorize your speech from a script? If so, throw it out. Instead, use a single page of large-typed, outlined notes. Then, practice it—out loud—three to six times, depending on the length and your comfort level with the material. When I started out, I used to write out my speeches and memorize them. The problem with this approach is that any slip-up throws you off and results in the “blanking out” and losing your place that’s so central to this fear in the first place. By using higher-level notes that key you into the important points, each practice run will feel more like a conversation, and the speech will develop organically. After you’ve put together your presentation and notes, find a room that’s as close to the real deal as possible. Practice with an overhead projector if you plan to use slides, and get a feel for the flow of the speech from start to end, such as transitions and areas where you expect to involve the audience. Practice the opening, closing, and any critical points (such as quotes) more often. This will increase your confidence at the beginning (when you’re most nervous) and help you close with a solid and memorable impression. Should you fold your hands, put them at your sides, or gesture with them? Are you making sufficient eye contact? Are you rocking, pacing, or fidgeting? Is your face making the right expression? You might have a million thoughts bouncing around your head about how you look that have nothing to do with the message. And yet, you know you’re being judged. We all have nervous habits that make us appear nervous—whether we are or not. If you can become aware of those habits, and develop new ones, you could learn to appear confident—whether you are or not. Ironically, even confident people can have habits that make them appear nervous. The key here is to appear as confident as you are in the message you want to deliver. If you knew you folded your arms, you would practice opening them up and using what’s called a “power” pose. If you knew you liked to stare at the same person (usually the most friendly faces in the audience), you would practice distributing your eye contact to make more of the audience feel included. But the only way to do this is to get feedback. How? Here are two ways I personally like to get feedback. You can use these to practice repeatedly and start replacing bad habits with good ones. Record yourself on video. Use your smartphone or a cheap video camera, and film yourself speaking for about 5 minutes. Then watch it back and write down the nervous habits that you notice most. This will give you the initial feedback to start replacing them with more confident, less nervous looking habits. Join a speaking club. Clubs like Toastmasters International, and training courses like Dale Carnegie, are designed around providing group feedback in a live setting, which will accelerate your awareness of your nervous habits so you can address them. The last is a fear of the audience not understanding you or your message—failing to connect. Why are you speaking in the first place? To inspire, persuade, teach, or inform others. 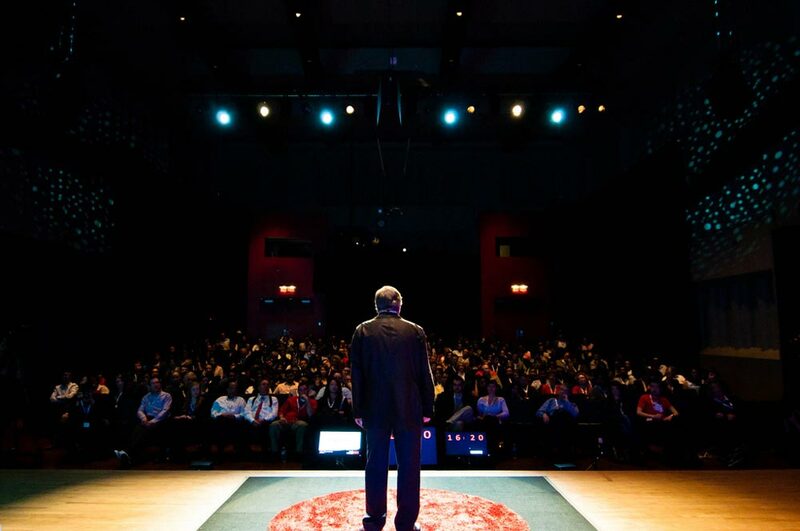 You might have the most amazing TED-worthy idea in the world, and yet you’re afraid the audience just won’t get it. Your fear is that you won’t connect. Remember that you’re trying to solve a problem for the audience—whether it’s inspiring or educating. They’re not here for you the individual but rather what they will hear from you that satisfies their burning needs, pains, or desires. One idea that’s worked for me is reaching out to or interviewing potential audience members in advance. If you can talk to even two or three members of your audience, you can tailor the speech to exceed their expectations. This will make it easy to connect. Also, make sure to mingle with the audience before you speak. This will help calm your nerves, give you a chance to ask what they’re expecting of the talk (and tailor accordingly in real-time), and appear confident, authentic, and personable. Lastly, tell your story. In Made To Stick, Chip and Dan Heath found that telling a simple story with emotion is much more powerful than your presentation delivery skills. My personal experience with these techniques gives me the confidence to stand by them. I used to be a shy, socially awkward, introverted engineer afraid of speaking up even in small meetings. Today I regularly deliver speeches to large crowds, compete in speech competitions, and present myself as capable and competent. But that’s only because I worked at eliminating these fears by developing skills, not by changing who I am. You can do the exact same thing. Now that you know the three most common public speaking fears and how to eliminate them, take action today! Did these three public speaking fears—and how to eliminate them—resonate with you? Reply below!